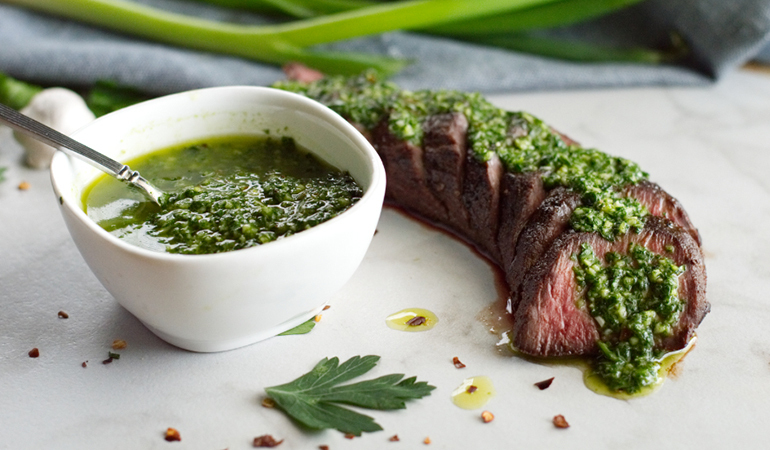 Bright, garlicky chimichurri pairs perfectly with cooked and seared venison tenderloin. This sous vide recipe couldn't be easier and results in an impressive dish with an explosion of flavors in every bite! If you haven’t tried sous vide cooking before, don’t be intimidated. 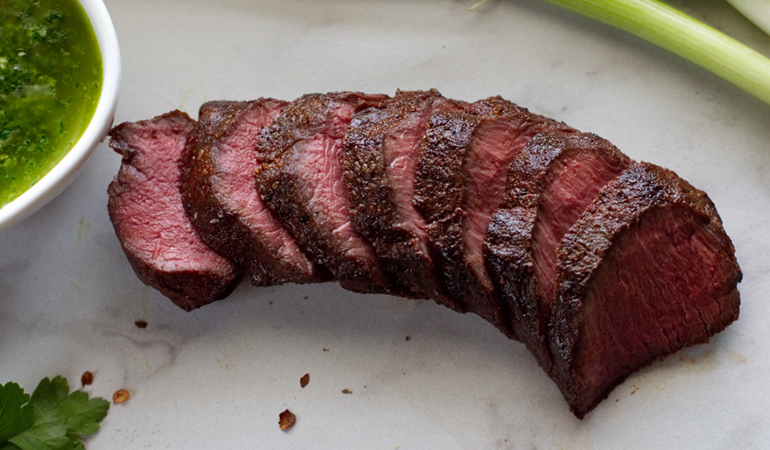 This venison recipe is simple to make and the results are insanely good! The gentle cooking that happens when you sous vide is perfect for lean venison. 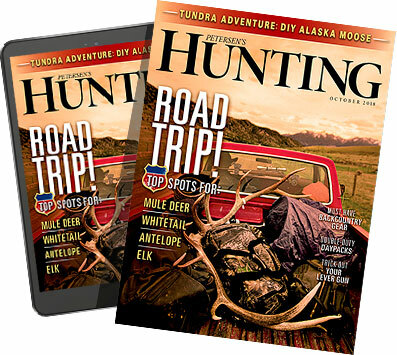 You can say goodbye to over cooked, dry meat and prepare yourself for a venison experience on a whole new level. These tenderloins are quickly seared off after cooking and served with a fresh, flavor-packed chimichurri… dinner has never been easier or more delish! This recipe is perfect for spring and summertime entertaining! In a food processor, combine the fresh parsley, oregano, garlic, vinegar, oil, pepper, flakes, salt and pepper pulse until a smooth. You don’t want any large chucks of garlic. 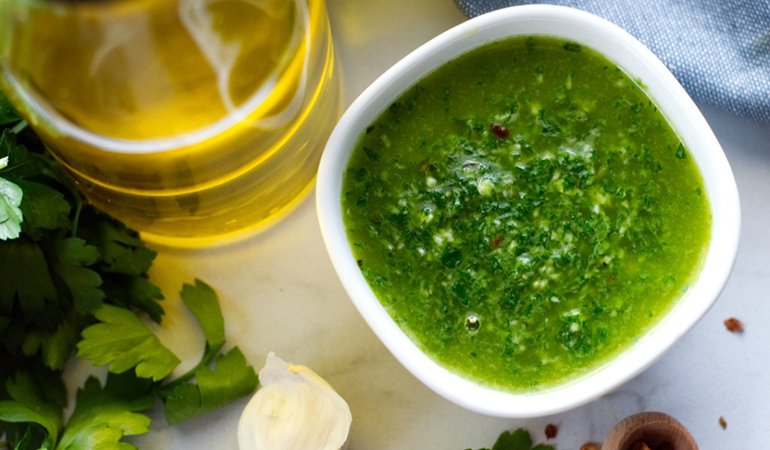 Pour chimichurri into a glass jar or container and set aside for at least 30 minutes. Set your sous vide cooker to 135 degrees F and preheat the water. Season each venison tenderloin liberally with salt, pepper, granulated garlic and paprika. Place the tenderloins in either a vacuum seal bag and seal using the manufacturer’s instructions or seal in a large zip-top bag, removing as much of the air from the bag as you can. Once preheated, place the venison in the sous vide bath and cook for 1 hour and 30 minutes. Remove the tenderloins from the bath and let rest in the bag for 5 minutes. Remove venison from the bag and pat dry. Finish cooking venison tenderloins on stovetop or grill. To finish on the stovetop: Preheat a skillet over medium-high heat. Add the butter and as soon as the butter is melted, place the tenderloins in the pan to sear. Cook 1-2 minutes per side or until browned and crusted. Remove from pan and let rest for 5 minutes. To finish on the grill: Preheat grill to 450-500 degrees. Grill the tenderloins for 1-2 minutes per side. Remove from the grill and let rest for 5 minutes. Slice venison tenderloins on the bias and serve topped with the chimichurri sauce.